The perennial tussle between the right to free speech and the right to privacy has a spatial dimension of relevance to any designer. Architects, geographers and planners are acutely aware of the relationships between public and private spaces. Free speech roughly equates to the right of access to a place (eg a city square, the countryside); the right to privacy approximates the right to keep certain people (intruders) out of a place (eg the home). Freedom to speak out, and its restriction, has other spatial correlates. Gagging someone physically, by removing their ability to speak, is often accompanied by restraint on movement. In any case the inability to speak restricts power over space. Think of a schoolteacher struck down with laryngitis and facing up to a class, or a street demonstration that does not at least occasionally break into chant to assert its presence. Even a silent vigil is bordered or punctuated by exhortations and murmurs. The voice is one of those dynamic sub-architectural elements by which space gets defined, structured and controlled. To deny the voice, by force or rule, influences profoundly the formation of space, and redirects the flows of power within it. Some Twitter users were quick to associate defiance of gagging orders with a climactic scene in Stanley Kubrick’s 1960 movie epic Spartacus. A Roman legion offers to spare the lives of an army of defeated rebel slaves if they reveal which one is their leader Spartacus. Before the real Spartacus can voice his own presence he’s drowned out by a chorus of dissenters shouting, “I am Spartacus.” Through this show of solidarity the men in his army all suffer the same fate but with honour and respect intact. 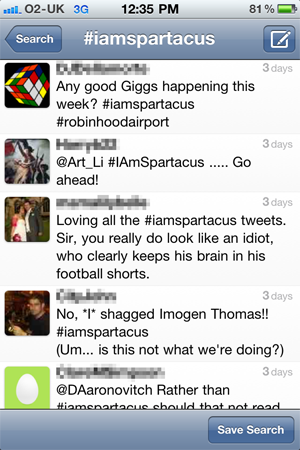 The “I am Spartacus” tactic emerged in the context of Twitter in November 2010, when hundreds of users rallied in solidarity with someone who had posted an ill-judged joke about blowing up an airport. In light of impending prosecution of the individual, other Twitter users posted or re-tweated the same message. You may be able to prosecute one person but it is not so easy to apprehend thousands (See Telegraph article). Other forms of civil disobedience rely on this tactic of numbers. More recently Twitter users obscured the culpability, if not the identity, of the user who first broke the gagging order on the identity and circumstances of the private life of a certain UK footballer. Notice here that the emphasis is not on argument or eloquence, but the voice as primitive apparatus of social cohesion and spatial definition: the voice out loud, in harmony or discord, with rhythm and repetition — the voice multiplied and propagated. Speaking-with is a strong expression of solidarity, whatever is said. Of course, gagging orders pertain to text as much as speaking out loud, and Twitter is currently a textual medium. But text and speech are intimately related, evident in the metaphors used by each. Gagging implies suppression of the voice; issuing an order is its assertion. 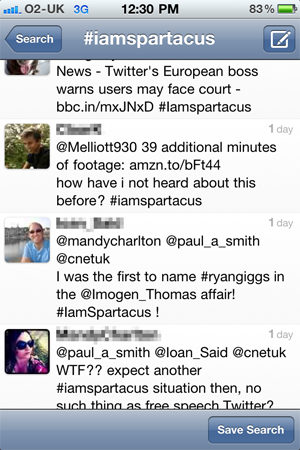 The phrase “I am Spartacus” has become something of a joke in Twitter posts, with fake declarations and cross references. 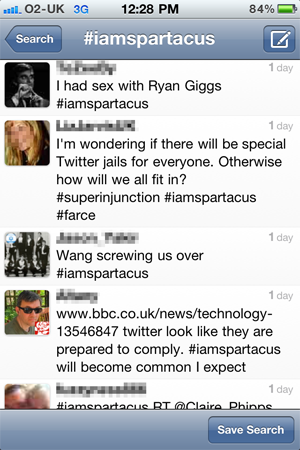 A search on Twitter for the #iamspartacus tag provides lessons in how the play of metaphor works. “I am Spartacus” is a metaphor, a literal falshood. A trope to subvert identification. Metaphor is also the designer’s weapon to assault rigidity, categorisation and authoritarian control of creative processes. Metaphor is also the way creativity happens. Ricoeur, Paul. 1977. The Rule of Metaphor. Trans. R. Czerny, K. McLaughlin, and J. Costello. London: Routledge and Kegan Paul. Schön, Donald. 1979. Generative metaphor: a perspective on problem-setting in social policy. In A. Ortony (ed. ), Metaphor and Thought: 254-283. Cambridge: Cambridge University Press. Coyne, Richard, Adrian Snodgrass, and David Martin. 1994. Metaphors in the Design Studio. JAE (Journal of Architectural Education), (48) 2, 113-125. Coyne, Richard. 1995. Designing Information Technology in the Postmodern Age: From Method to Metaphor. Cambridge, Mass. : MIT Press. Snodgrass, A.B., and R.D. Coyne. 1992. Models, metaphors and the hermeneutics of designing. Design Issues, (9) 1, 56-74. For more on the voice see the post the king’s speech impediment.